Stores Ref. 22c/313. Size 4 (Ht. 5'8 - 5'9", Br. 36 - 38", Wt. 32 - 34", St. 37 - 38". Leg. 29.5"). Early wartime version of the Sidcot produced in grey green rubberised cotton as used for the 1932 pattern Mae West. The material is in very good overall condition - a little faded in places and with some light soiling and marking. There is minor damage adjacent to each of the leg zips (see photograps) and the internal rubberising is shedding a bit as usual. The suit retains its cloth hanger, buttons and 1940 dated label. The lining is also stamped with 'PP', '40' and '8'. All zips are original 'Lightning' brand and are in good working condition though they would benefit from light lubrication. The lining also appears to be in very good, reasonably clean condition. Also fitted with a good matching 1930 pattern suit collar having clear Air Ministry marks. 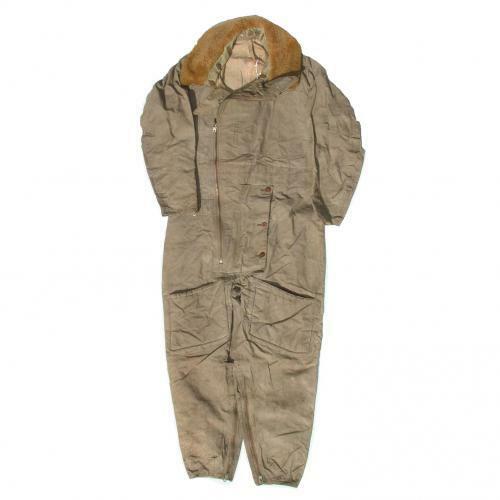 Overall this is a very good used example of the scarce 1930 pattern 'Battle of Britain' suit. Stock code S19188.